The 24th Conference of the Parties (COP24) of UN Framework Convention on Climate Change (UNFCCC) is taking place from 2 to 14 December 2018 in Katowice, Poland. Delegates from the Heinrich Böll Foundation Offices worldwide and their partners are represented in the COP 24. The Heinrich Böll Foundation, Beirut office – Middle East is supporting journalists from the region to travel and report on the conference from Katowice. The following web-dossier includes publications, written and audio-visual media coverage of the Katowice Climate Change Conference from the Heinrich Böll Foundation delegates and journalists in English, French and Arabic. In her article, Suzanne Baaklini presents initiatives by individuals that changed the lives of thousands of people. In her article, Suzanne Baaklini focuses on how the recent crisis in France is covered in Katowice and taken as an opportunity to talk about "just ecological transition", which would not absolve anyone. The article discusses how the 24th UN Climate Conference (COP24) was engaged in its last days in an intense ‘finish’, hoping for an ambitious agreement for the implementation of the Paris Agreement despite. This article discusses the Arab Climate Act Program that was launched by NGOs in the COP24 and its objectives. A unanimous scream at COP24: "We're out of time! " Suzanne Baaklini follows hundreds of activists in their parade during the traditional climatic march. In all minds and slogans, the words "We have no time!”. In her article, Suzanne Baaklini presents the last minute deal that was agreed upon in Katowice. In this article, the Lebanese journalist confirms that while several points remain litigious, the time for political compromises has come. ‘Mahawer’ or Talks with Habib Maalouf: Reasons for failing to combat the threats of climate change from Kyoto to Paris. 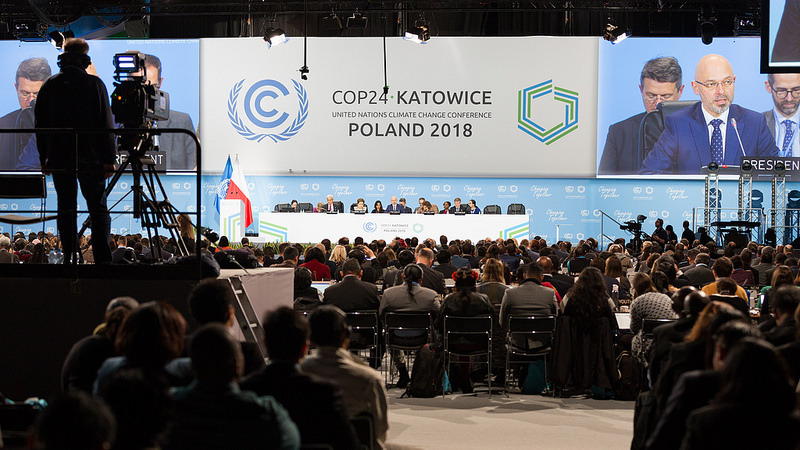 In this article, Habib Maalouf presents the main points discussed in the COP24 summit despite the disasters happening in the world, the drop in oil prices and the protests. Poland's climate summit fails to activate the Paris agreement: The Earth's temperature will raise by more than two degrees! In this article, Habib Maalouf summarizes the results of the Climate Summit held in Poland. The Fate of the Climate Depends on the Fate of the Protests in France: In this article, Lebanese journalist Habib Maalouf discusses the importance of monitoring what will happen in France in order to know the fate of the planet. The Paris Climate Agreement: The Lebanese Ratification is not a Luxury: In his article, Lebanese journalist Habib Maalouf presents the reasons for which Lebanon, out of 13 countries in the world, has not yet ratified the Paris Climate Agreement.